Show Up to Speak Out! LAKELAND – As in years past, the Florida Conference is making plans to participate in Florida Advocacy Days (FAD), hoping to amplify the state's littlest voices with a United Methodist megaphone. 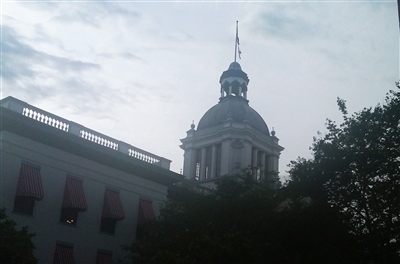 The three-day event is scheduled for April 7-9 and coincides with the United Way's Children's Week in the state capital. Rev. Tammy Fisher, who is coordinating conference participation in the event, said organizers are hoping for a record turnout of people willing to bend the ears of state legislators on behalf of people in need. "We are called biblically to do justice and to speak up for those who are needy and poor," Fisher said. Anyone in the conference can participate. Registration costs $80 and is due by April 2. For information and registration, click here. Fisher said individual church ministries work hard to address the results of public policies that neglect the poor, but events like FAD have a broader reach by striving to change those policies. The conference partners with Florida Impact, a 30-year-old nonprofit organization with religious roots that helps identify timely issues and conducts a daylong briefing for Methodists from the Florida Conference and the 11th Episcopal District of the African Methodist Episcopal Church before they meet with their legislators. "It's a time we get to educate the legislators because we've been educated," Fisher said. This year, the emphasis will be on feeding and housing children, as well as making sure their medical needs are addressed. Bishop Ken Carter, who began his appointment to the Florida Conference in September, will take part in FAD for the first time. He has called a Cabinet meeting in Tallahassee as well, so that members can conveniently add their voices to the event. "The Florida Conference Cabinet will be in Tallahassee … to gather with citizens across political lines who care about the basic human needs and rights of children: food, shelter, safety and health care," the bishop said in an email. "At our best, United Methodists have always combined personal and social holiness in our expression of discipleship. We invite lay and clergy leaders from across the conference to join us in prayer and advocacy." Methodist involvement in FAD has led to legislative changes for the state's summer feeding program for children that last year dramatically boosted the number of churches and schools offering free meals and attracted increased federal funding. An intensive publicity campaign led to more children being fed because more parents found out about the program, said Dr. Debra Susie, Florida Impact's executive director. 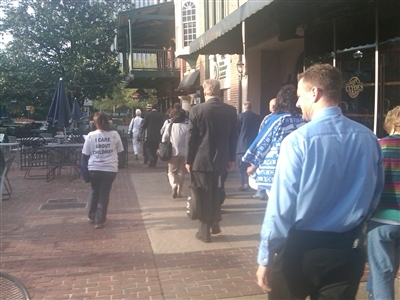 Participants in Florida Advocacy Days 2012 gather at the state Capitol, ready to talk to legislators. Photo from Rev. Tammy Fisher. More than 500 new summer feeding sites opened across Florida, an increase of 18 percent, according to Florida Impact. The organization reports that nearly a half million more meals were served in 2012 than in 2011. "We did this all with the help of the churches at every level," Susie said. impressed last year with FAD participants' reception by state policy-makers. "They were appreciative of our time, informing them about the issues, advocating on behalf of children instead of wanting something selfish, and the offer of prayer, which they took us up on," Bennett said. "Those participating were inspired because they could see the fruit of their labor through legislation." Fisher said FAD began as an outreach ministry of United Methodist Women that later was adopted by the conference. Organizers have been discussing ways to include representatives of other Christian denominations in future events, Fisher said. This year's event begins with the "Hanging of the Hands" at 12:30 p.m. Sunday, April 7. Artwork made from children's handprints submitted from around the state is hung in the Capitol rotunda to remind legislators of the importance of Florida's youngest residents. Methodists then meet at 6:45 p.m. at Trinity UMC, Tallahassee, for worship and communion, followed by a fellowship reception. Monday, April 8, will be a day of briefings by speakers lined up by Florida Impact. Included will be an orientation session to coach new participants in how to reach their lawmakers with their advocacy message. 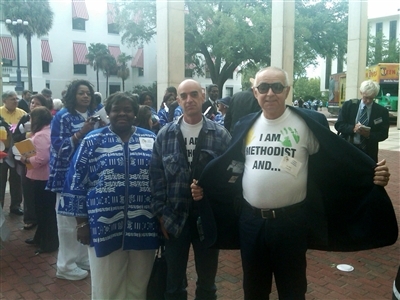 Florida United Methodists march to the Capitol to advocate for people in need at the culmination of Florida Advocacy Days 2012. Photo from Rev. Tammy Fisher. The final day, Tuesday, April 9, will start with the bishop's prayer breakfast, followed by a march to the Capitol, a news conference at 9 a.m., and then visits with legislators. The Florida Conference has arranged a discount lodging price of $50 a room, with up to four in a room, at a conveniently located Super 8 Hotel, (850) 386-8286. Other nearby hotels are listed in the FAD brochure and at www.childrensweek.org. Those who wish to submit artwork for the Hanging of the Hands event must do so by March 29. Click here for guidelines. Anne Winn, who chairs the conference's Coalition for Advocacy and Ministry with Children, said 2013 will be her third year of FAD participation. In years past, she has been especially moved by the artwork hanging in the rotunda. "As you look up, it is a cascade of children's hands that has been strung together," Winn said. "They hang from the first, second and third floor. They also decorate the columns and any space where you could hang these hands. "These are the hands of Florida's children. … It's just a blitz of creativity and it's so powerful to see them." The Legislature is in session on advocacy day, when participants meet with elected officials from their House or Senate district, and FAD participants get caught up in the Capitol's busy political ambience, Winn said. "Once you go to it, it's like, 'I need to go back,'" Winn said. "You'll never be in the seat of government and able to talk to people as you will on this day."